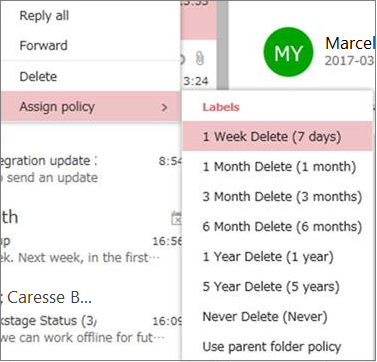 If you're the owner of a group in Outlook on the web, you can apply labels based on policies that control how long a group conversation will be retained. The labels you choose are created by the administrator for your organization. Note: You'll only be able to label your conversations if your administrator has turned on this feature for your organization or school. Right-click the conversation you want to label. Select Assign policy > Labels. Choose the label you want to apply to your conversation.